Paleolicious Bread Baking Mix, which you can purchase on Amazon. Jeb Food’s Organic Cassava Flour is the only one we use in all of our baking products. Put Paleolicious Bread Co in your search bar to find our baking mixes faster on Amazon Prime. Spray the muffin top pan with cooking spray. Once you have prepared the bread mix, fill each muffin top to the top. Bake at 350 for 15 minutes or until firm and muffin top can come out of pan easily. Repeat to finish the remaining batter. Muffin top pans make 6 muffin tops at a time and the mix will make 12. Increase the oven temp to 400 degrees. Top your muffin tops with pizza sauce or garlic sauce and whatever else you like on your pizza. Bake again for about 15 minutes or until toppings are melted and cooked thru. These make the best personal GRAIN FREE & GLUTEN FREE pizza’s!! 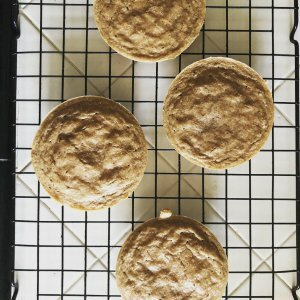 You can also use these muffin tops as sandwich thins or hamburger buns. My family loves these! They freeze great. Pop them in a toaster and they will taste like they were just baked!